Camping La Halte de Mainville er en campingplads i Ressons-le-Long, Aisne. Denne campingplads har pladser der er afmærkede og pladser med en smule skygge.Det er muligt at leje mobil homes og bungalows. Campingpladset har et sportsområde. Denne inspektør besøger hvert år Camping La Halte de Mainville og inspicerer campingpladsen ud fra omtrent 200 faciliteter og andre fokusområder. Inspektøren arbejder for ACSI og arbejder altså ikke for campingpladsen. Lovely quiet site with very generous pitches of which we had the choice, as it was not very busy. Choice of hedged or under trees. Static caravans with mostly English. Toilet blocks very clean. Owners extremely helpful and approachable. Can order baguettes for next day. Doesn’t take credit cards but allowed us to pay later during our stay. Easy to find and definitely would return - so glad we chose this over the nearby, large, alternative campsite! We stayed at this very well maintained and run campsite for a weekend in March 2017. Family that own the site are very friendly. There were lots of leaflets showing where to visit Mr pointed some very good places to visit. Showers were very hot and clean. WIFI available in club house was not fast but it was reliable. We were able to choose whatever pitch we wanted and there was water supply to the pitch. Very pleased with this site and we will be returning. They have three lovely border terriers. A nice children's play area and the swimming looked inviting but the water would not have been warm enough yet.a great site for both stopover and for visiting the area. Our party of 6 people in three caravans moved here from La Croix du Vieux Pont, and the contrast could not be clearer. The pitches we chose overlooked a small lake used by fishermen. The site itself was immaculately maintained. The swimming pol looked very attractive, and was used by youngsters mainly,as it was not heated. and pur party were Old Age Pensioners! The site owners were very helpful, and welcoming. We enjoyed our seven night stay here. This lovely well kept site with flat, hedged pitches is situated in a quiet village. Plenty of leaflets and maps showing things of interest in the area, the English speaking owner is very helpful. Went for a viewing the day before we took up residence as not happy with site we were on. The lady of the site told us we could look around and she would reserve us 4 places. We chose pitches that overlooked the small fishing lake, ducks and geese were in residence but did not cause us a problem. There were noisy dogs in one of the mobile homes but the owners were feeding the geese and it was annoying the dogs. This would not put us off returning as it is such a good site. The toilet /washing facilities are a bit outdated but were kept clean. As the weather wasn’t too hot we didn’t risk the swimming pool but it did looked inviting!! There is a boules alley and games room with table tennis, this is where Wifi can be connected with no problems. Bread can be ordered for the next day. Intermarche is local and Cora with fuel is towards Soissons. If you are looking for a good, clean, peaceful site this is where to go. Landscaped campsite with huge pitches, around a small fishing lake. Friendly staff. Immaculate toilet block (own paper needed). Free wifi near reception. Games/play/swimming area. Lovely countryside, good for walking and cycling. Lots to see and do. Would recommend for any age. Only drawback is that shops etc are 5K away. Vil du booke Camping La Halte de Mainville eller have yderligere information? Det kan du via nedenstående oplysninger. På N31 Compiègne-Soissons ca. 15 km fra Soissons skal man tage D17 i sydlig retning. Følg skiltene mod campingpladsen. 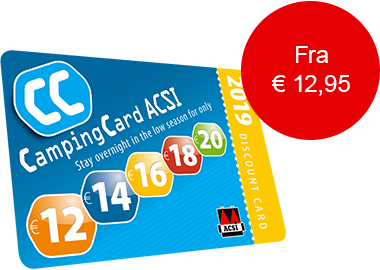 ACSI Eurocampings sender din forespørgsel videre til "Camping La Halte de Mainville".